a little traveling letter mat! just a little matching activity... with a little pocket to store all the pieces. i started by measuring out the fabric... each box is about 1 1/2" x 1 1/2 ". i did a 5 x 6 square grid, so there would be an extra line of boxes along the bottom for some spelling. i also added a 1/2" border around the whole thing. i drew some temporary lines for a guide, and zig zag stitched the boxes. then i serged around the whole thing. i did an extra line of yellow zig zag along the bottom of each letter, so leo would know which side was the bottom, especially for the letters that could go either way. and then, to make it super portable, sewed on a little strap at the top and added some snaps so it could just roll right up. and there you have it... learning on the go! 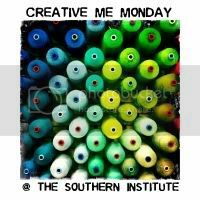 i linked up with creative me monday at the southern institute and sew much ado! thanks for stopping by sharlene! and for the sweet words :) just recently, it seems like my mind has been racing through some kiddo learning crafts... i hope there will be more to come!